If you’re heading to the St. Louis airport, check out the new “Air Claire” McCaskill billboards on 170 near Interstate 70. Conservative group launches “Air Claire” billboard campaign in Missouri. American Crossroads continued its offensive against Senator Claire McCaskill (D-Missouri) with new billboards and a statewide radio ad slamming the senator for her billing of taxpayers for the use of her private jet. 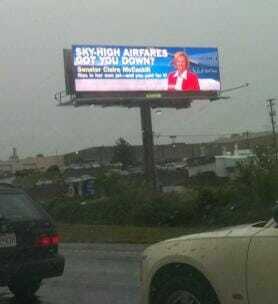 Complementing the billboard campaign is a statewide radio advertisement, which uses real audio of McCaskill responding to questions about the private jet issue. Both the spot and billboard are part of the American Crossroads www.TruthAboutClaire.com campaign, and can be viewed and listened to here. “We’re going to make Air Claire famous because McCaskill’s private jet symbolizes everything that’s wrong with her candidacy: living large on the public’s dime, dodging taxes while voting to raise ours, and being out of touch with everyday Americans’ lives,” said American Crossroads president and CEO Steven Law. McCaskill is widely considered one of the most vulnerable Senate Democrats up for re-election in 2012.